Marketing is the key factor for being and growing in education field, does not matter you are running a play school or senior secondary school. If are even running school in village, small city even in metros you need to have proper strategies for increasing admissions or enrollment. Actually, the main fact is that, why I am writing this article and even why you should listen to me, actually I have been involved in digital marketing since last 6 years, yes that's more than half decade, even I have been directly attached with education institutes in India as well as overseas. This article is going to be very lengthy, so have a cup of tea and keep reading and yes, get a pen and a paper that's why you can write and read together, which is the best way to learn. This is one of the biggest problem of educational institutes, actually this is my own analysis, they don't invest on their existing students. They invest on campaigning, advertisements, flex and these that, those are good but first give best to students, according to your available sources. Like best teacher, best infrastructure. If you said parents to provide power backup facility means, give; don't put a generator on your school campus only for show off. Have good dedicated faculty members. Its not all about advertisements, its about helping each other. I mean management helping students, parents will pay fees, so it is interdependent to each other, this should not be one sided. I mean you need to make a balance, don't think about saving money always think about what you can do for them. You will have profit. I am sure, but first make a school famous, better. I mean be the best at least in your region. Then even you don't need to read my article. Because your students & parents will do marketing. Actually, one thing I very closely analyzed that, every organization needed all type of people to meet the need of the institutes. So, it is one of the simple way to maintain well healthy environment on the campus, in this way experienced people will get fresher to trained and freshers will get chance to learn from experienced and they will improve their teaching skills. Paper advertisements is also good. Its different, I mean you must not focus only marks, that's good that students are doing well in academics, but they must be look like complete school. They must be mature enough to choose right thing, means what is right and what is wrong? That is why they are getting education. They must have over all knowledge about the country, them self too and have clear vision towards life with honesty. Yeah, that is one the tremendous way of marketing and providing new world to students, trip always helps students to learn something new and see the new world. I mean out of the routine, but trip would be depend on type of school you are running see, if you are running a kid play school then you can choose near by popular spot. If going outstation then talk to hotel people already before reaching there, would be nice. Yeah, now a days you need to help students to crack competition examination from NSO, ISO, NTSE, KVPY, All Engineering entrance examinations, Medical entrance examinations. You need to work on from ground level means from class 5th onwards motivates students to work on themself to improve every day. I will share with you a simple rule, just follow this rule itself and tell all students, faculties too and see result just after one month. Yes, the rule I must share with you- Improve Daily or Continuously. Students: Tell them to learn something new daily and what they have learnt tell them to do revision. Faculties: Don't put any burden on them, just faculty discussion session would be great once in a week for one hour, for their improvement. Management: Need to take care about students and faculties development and help them where they are getting problem, if management will think growth of them, then definitely there would be growth of management also: Newton's Third Law! But, let me share with you very closely, actually what you need, consider feedback of brilliant student because in the society people are going to ask brilliant student even in this way those are average they will also start studying. Yeah, I am talking about committee, see their should be a committee, that's why they will take care of students overall. Where required they will help and then I am sure students will be happy and of course they will grow overall, that is really needed in this age of competition. This is the missing part of almost every organization. May be this is the same scenario in your organization too, I don't know about that, but if it yes then it is needed to be change. See, top management need to see them also part of the organization and of course their should be a committee for the good of faculties, then definitely management will get great benefits of it. Let me share with you one incident, this is not something, this is REALLY IMPORTANT! Actually, one day, one of the madam ask a kid, what you like the best in the school and that kid replied: my teachers. Means without teachers, school is like just a building nothing else, so it is necessary to think about them, more management think about faculties, more faculties think about the organization, I mean about the school. There should be responsible moderators for running the committee successfully. I know may be it is little bit confusing you. See, notification means send message and give access to parents to see growth of students online, see if you are running play school then this is not that much required but yes, if you are running school till 12th class then it is required because these days people don't have one thing that is time. So, they will not come to school regularly, if they will come they are investing time, so why not to help them to save time to make it online. That would be pretty smart idea and I am sure this is going to be VIRAL among people after implementing this, it is really simple and even cheap. I know it is little technical, so if you need any help then you can ask me, I will definitely help you. Ask parents to come to school premises and trained them how they can able to check their kids performance online. Even you should trained faculty or who will update all these. Because implementation of new thing is good but proper utilization that resource is also important. One simple tip, I would like to share with you don't tell your teachers to maintain attendance only involved them to teach students. Because, their work is only teaching and that would be much better even time saving, I mean maximum time they can give to students, attendance is taking even 5 minutes a day for each class then if they have 6 classes a means 30 minutes is going behind attendance think about it. Yeah, online attendance required, that's why even parents see their kid attendance not only attendance even their performance. But, yes investment is required for making it happen, if you are thinking about average expenditure then its about 30,000 RS per month. Going door to door campaign means your school is not having students or even its not like running educational organization. Yes, must be in contact with parents and take care of their kids in school, rest will followed, see if you wanted to run campaign for marketing purpose then organize inter school or open tournament not only sports but also function can be organized for metal sports like quiz, maths running and there are severals ideas out there. Yeah, best part is that prize should be good that's why they will also come again and of course they will talk about the competition in their society. This is one of the effective and positive way of marketing. Actually, if you ask me what is the best way of marketing. Then definitely I will share with you that is mouth to mouth to marketing, well the next question is that how it can be possible? I am here to share with you answer of it. I mean think about it, when you talk about someone at home, may be for good or bad, I am sure if you see something wrong or something good right. Is not that mouth to mouth marketing. But, it is also TRUE, it is not an easy task to make others talk about your organization, neither even impossible it is possible. Yes, for this school management needs to put effort, time and of course need to have patience with positive hope. Online Presence Required, it is sure many school management already working on it, but does not matter what they are doing they are still behind because it is really wide and beyond imagination of any 19th century people. This is my personal believe. See, if you want real online presence of your school then you have to set up a real team, see it is up to you and your school management. But, it is not a single day job. Its a process and not one time, means you have to keep promoting your school on daily basis, of course you are going to get good ideas here, those I believe and share with many educational organization, I am sure many of these tips you have not heard till now. Have Facebook Page, Twitter, Pinterest (Great for Sharing Images), Instagram, Google Plus Page too. Create a Youtube Channel and share few videos of your school and if possible few videos of lectures would be much better. If you are running a play school then you can hire someone virtually, but if you are running a school, that's why you can afford a marketer then definitely I will recommend you to do that. Because, now a days it is really necessary. Let me share with you a simple tip, see find out any techie faculty who can teach in your school and can handle digital marketing would be better as well as money saving for school. Flex advertising is good but its a old one, I mean have you ever read any flex till now while travelling or may be while going to market. May be you have read, but think about the percentage. Its really less, is not it. That is the main reason I have used their that term re-branding, so using flex for re-branding is the perfect idea, means if your school already have good name then you can put flex but that exactly you are doing for providing good education to the society. Just put flex in before admission with attractive discount for bright mind, well below ideas you will find out more about it. Conducting test is one of the key way to attract bright students by providing good scholarships to good rank holders, in this way if your school providing good facility they even huge number of students will come to know about it. Yeah, one more thing which is most of the school missed. That is they don't provide such facility to their existing students, in this way they are missing mouth to mouth marketing about the test. Do one thing, provide such scholarship to your existing students also, that's why they will tell others about the test as well as they will be very happy to get scholarship. I have seen the biggest challenge to make it successful, see organizing such scholarship is good but how you can make it happen so big. How to ensure about strength will come for test that's why you can make proper arrangements: this is a UNIQUE REMEMBER: Put the way for registration is missed call on a number or whatsapp their kids details and of course don't forget to send back message or call, which would be conformation call, in this way you can build proper relation. One of the biggest asset of educational organization is their existing students and then faculties, if the organization will take good care about both then definitely they will talk about the organization. Actually, personally I believe in mouth to mouth marketing. This will happen of course, but it takes time and to make it happen quite easily you need to work on behind a cause if you will work behind a cause then you will definitely get success. Faculties: Don't try to make them feel that they are working, make them feel that organization is their only, timely salary, increment, arranging development programs, inner circle growth. Yeah this is a unique one, let me share with you how you can implement right way, I am sure there are many those did good in the examination. So, make flex for individual students with their achievements and put those flex in his or her village, that's why villagers will come to know about the school as well as about students. Do this for all achievers in your school, then see definitely there people will talk about that student achievement. This is one of the amazing way to advertise on target and get most out of it. This is the key to stay in touch and make a reason for existing students to study and of course in this way your school alumni's will feel proud. In any celebration time, like after result. 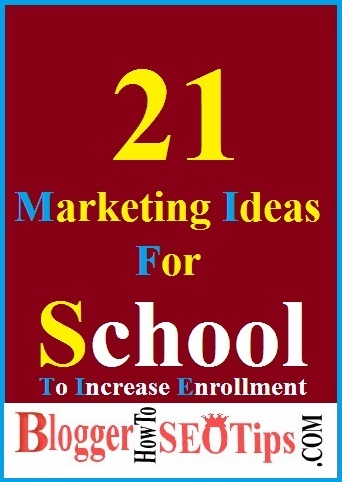 Just Beginning, I am working on a book, which is all about marketing for education institutes and of course after implementing these ideas you are going to get lot of benefits, but it takes time to get fruit of it. Remember that, you can not get instant result from it, because its not like cooking its like making someone healthy through your food. Do everything what is good for future of students, help students to find out their real talent in schooling that's why they can do much better in future. Tips and tricks; I have shared with you are really good for marketing of your school, but this is also true implementation of all tips at a time is really hard. I know about it, so I will definitely suggest you to implement ideas one by one that's why it can be implement right way. Is there another question have in your mind, then don't forget to comment below and need any help then you can contact me.